So we’ve seen the seals (KI Part 2), what else is there to do? 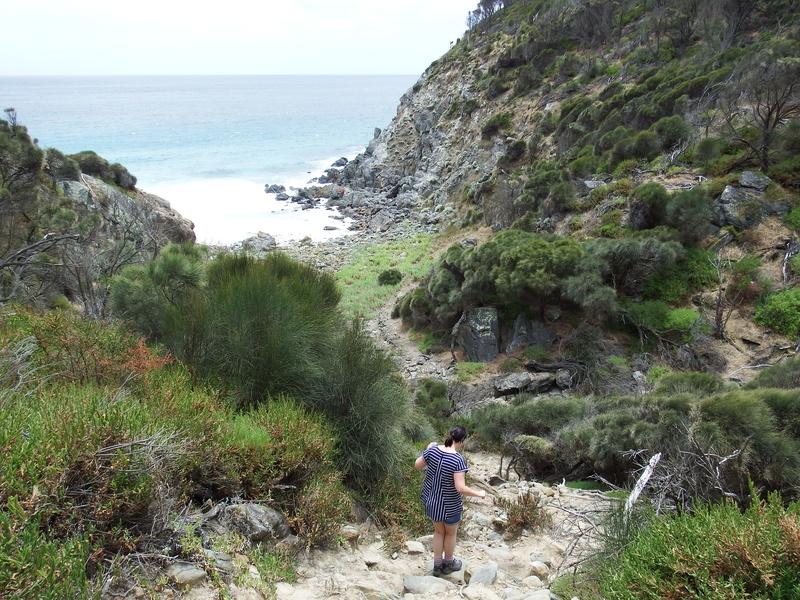 Well, there are heaps of walking trails on the island. 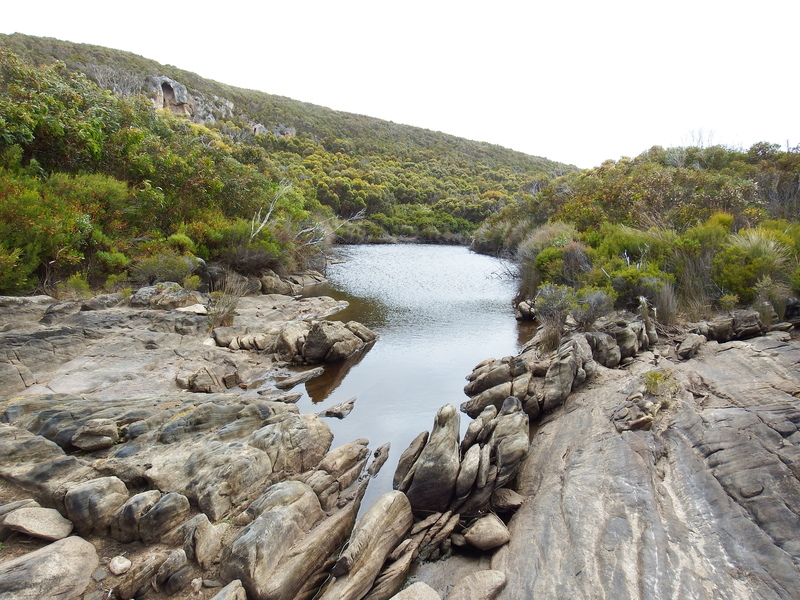 Most of them are located in Flinders Chase national park, we tackled a few of them. This is a short loop walk from the visitor centre and we spotted kangaroos, echidnas and heath goannas during the easy 30 minute stroll. We left camp at about 5pm hoping to spot the elusive and shy platypus in the early evening. After around 40 minutes walk along a flat and easy trail we arrived at the first viewing platform. We waited for about half an hour, quietly and patiently waiting for a glimpse. There were signs they may be about, bubbles rippled on the surface of the river tantalizing us with the possibility they were just digging around on the bottom, but in the end we gave up unsuccessful. We stopped at all the other viewing platforms, but our only wildlife encounter was with a snake the slithered across the path in front of Alan (Emma’s Dad). Checking in a book when we returned to the visitor centre, we think it may have been a young brown snake. 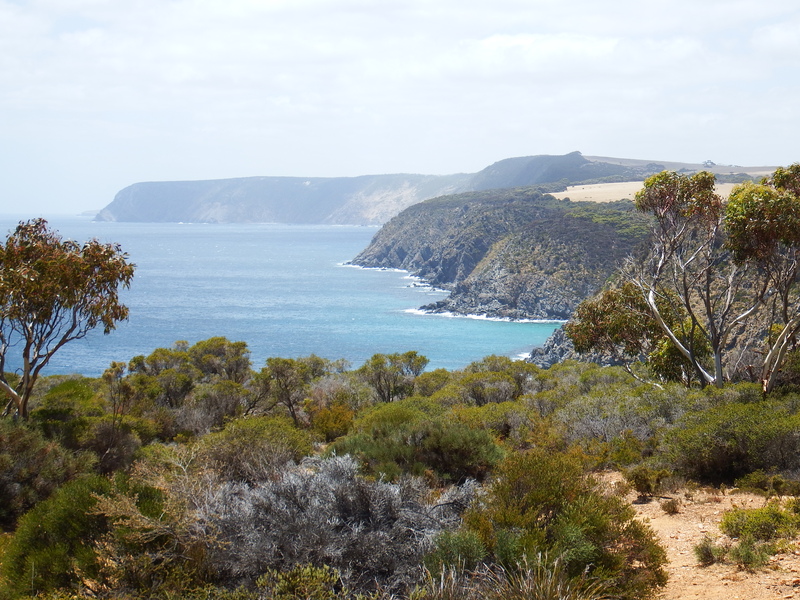 On the northern edge of the island sits Cape Borda. This is an unusual lighthouse for two reasons. First, that it is located on the top of a cliff, so does not need to be very tall. As it doesn’t need to be very tall it has been built in a square shape, which is cheaper and easier to build than the round ones. 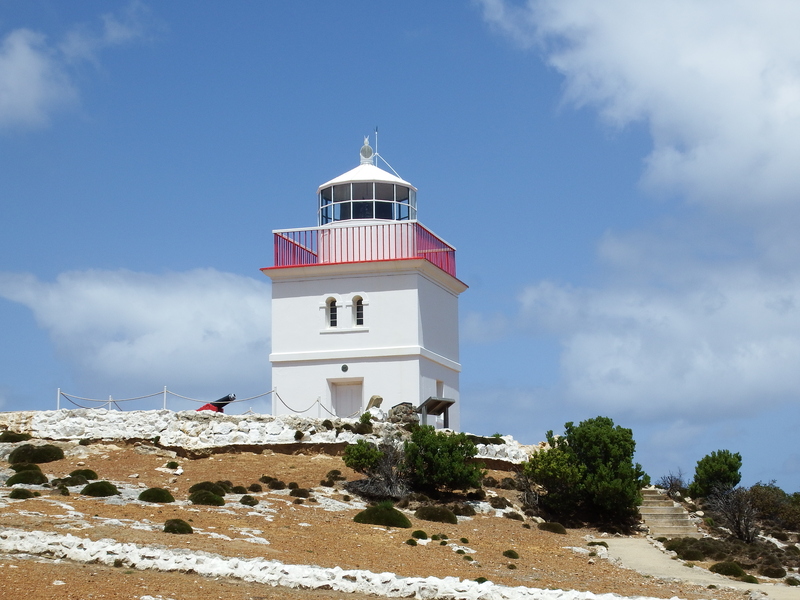 Second, that is still an fully operational lighthouse using the old lamp technology, whereas most of the other lighthouses on the island are now just used as beacons, which are identified by the timing of their flashes, Cape Borda still projects a solid beam of light into the sky divided by the prisim lenses. 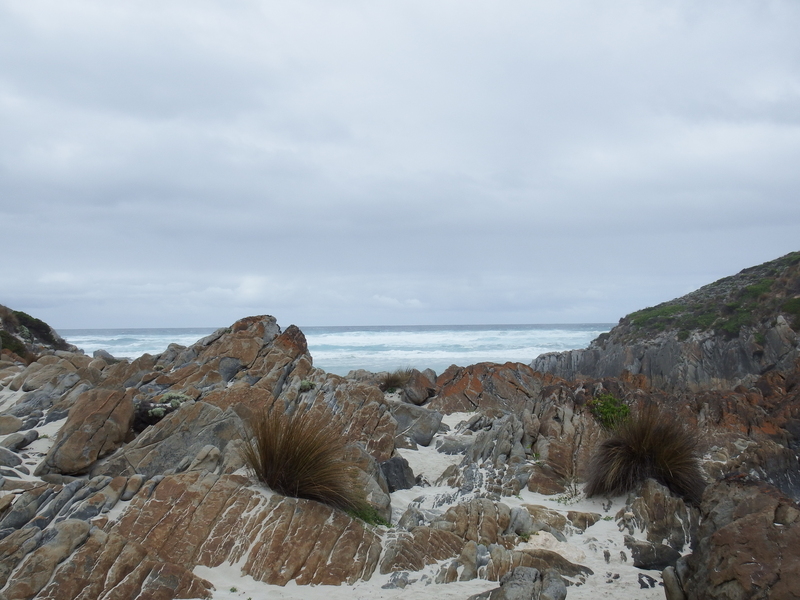 There is a walk here down to a viewing platform of the coastline. No walking trail here, but we stopped for a photo. This is the location that the three monthly supplies were delivered to the lighthouse. It is four kilometers away from the lighthouse itself and is up a very steep hill. We took the walk down to the bottom where there is a lovely little inlet. Any relaxing done at the bottom was erased by the hard climb back up the hill. We were just grateful that we didn’t have to drag supplies up with us as calves and thighs were burning hoisting ourselves back up the trail, sometimes scrambling on all fours. This was definitely mountain goat country! 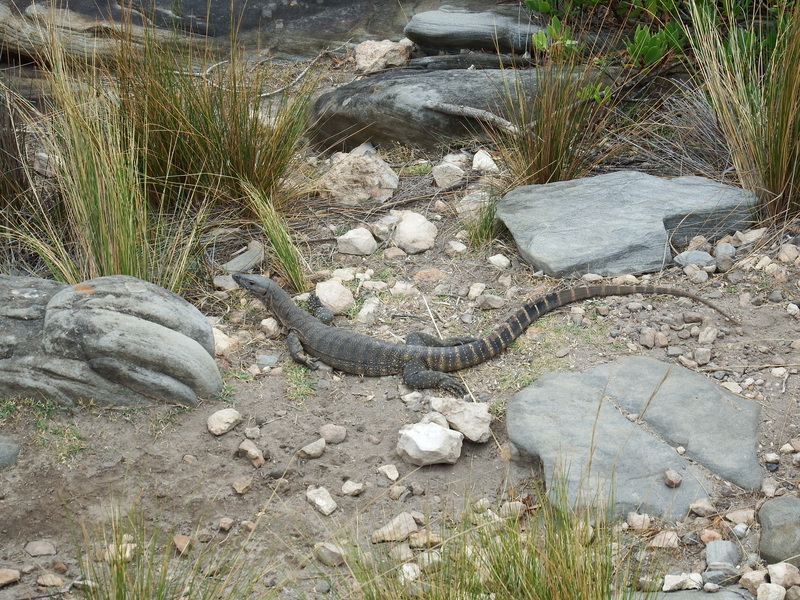 The Snake Lagoon walking trail is approximately 4km. 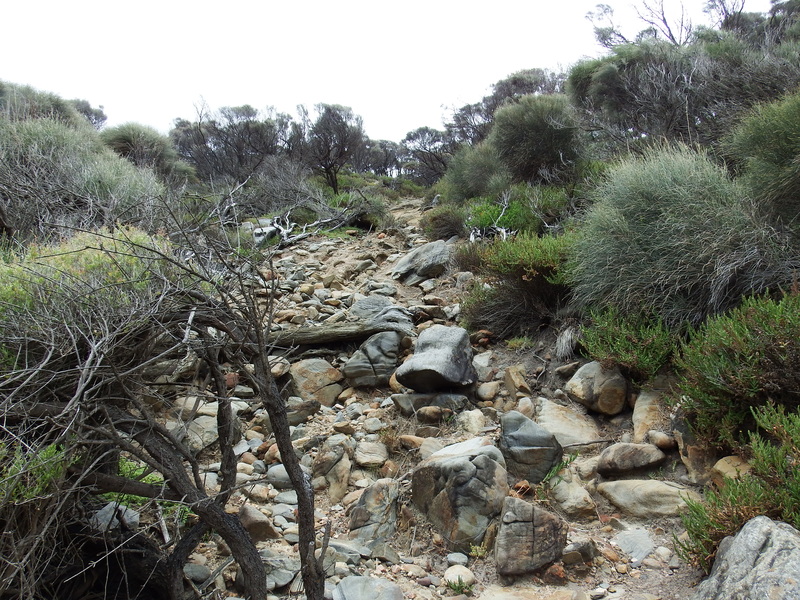 The trail meanders through the scrub before opening out across a rocky expanse. As we are visiting in the middle of summer there is no water running, but this is where the rocky river flows out to the sea. 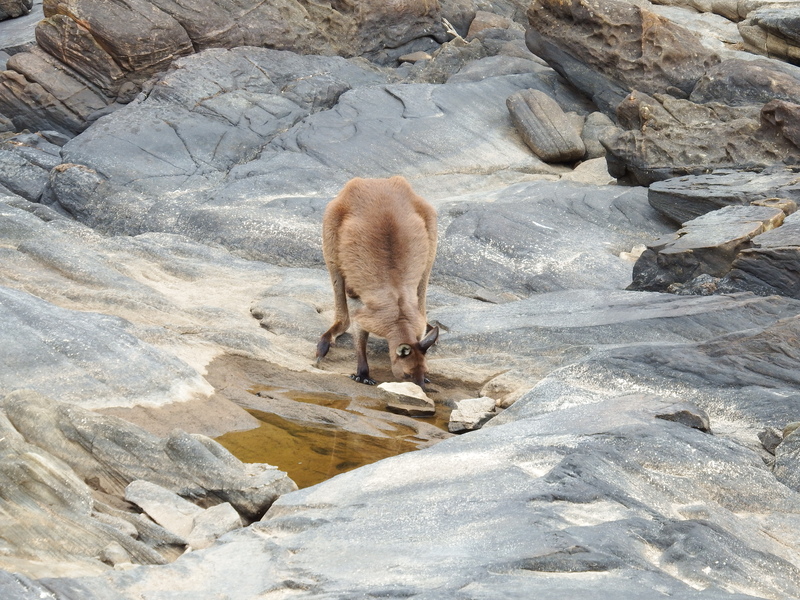 The path continues along the edge of the riverbed where we saw a kangaroo taking a drink. Arriving at the ocean we stopped and had a snack and a drink before returning back up the trail. Although we were talking and being quite loud we rounded a bend in the path to find ourselves only a meter or so away from a kangaroo. 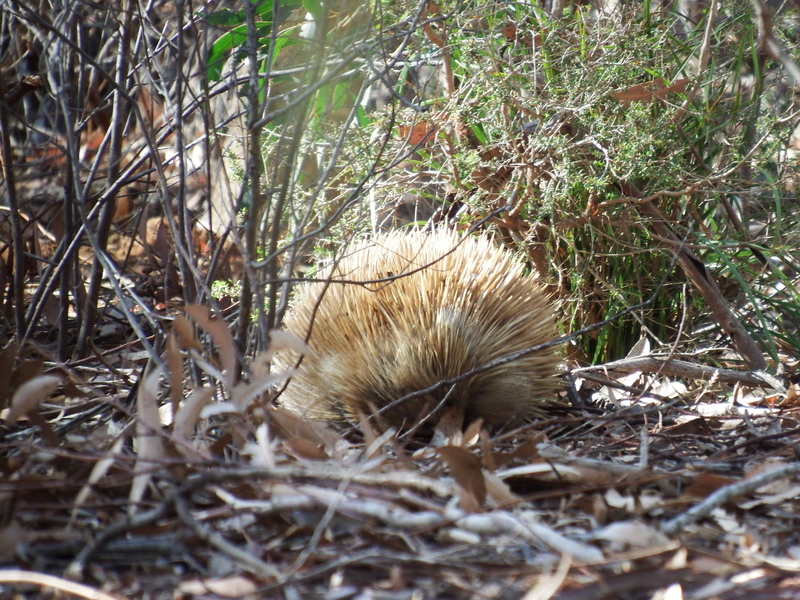 We think he gave us a dirty look before bouncing off into the bush.